This is so exciting! But why must we endure a blackout? I am keeping this short so all I shall say at the moment is, mscha, I completely agree with you about Lost. Also, to those who created them, I loved the OTTifications! I'm making a map here; understand! Now another sea will come and flood yours! except the ones that we missed! you must say goodbye from here so you can move on! You have walked too far to die - it is suicide to try! You must stay here where you're still alive. We did not know about your tribe. You say they don't like you? So maybe they hoped for you to die. and we're sure we're safe inside this castle of mine. That was a joke: Haha, fat chance. because you stole all our maps! and I look down there, it makes me glad I'm not you! There's a torrent coming in, you can't fight it, you can't win! In the Château d'If, we're still alive. I'm on a mountain and I'm still alive. I'm doing research and I'm still alive. I'm in a castle and I'm still alive. While you're dying, I'll be still alive. And when you're dead I will be still alive, still alive, still alive. Last edited by taixzo on Wed Jul 24, 2013 2:57 am UTC, edited 1 time in total. and I look down there and I'm glad I'm not you! And when you're dying, I'll be still alive. ETA: Oh, hello. The Popey thing right. OK, so things that could be floating out at sea, which Cueball saw, and no one paid any attention to him: Conjecture away! Last edited by k.bookbinder on Wed Jul 24, 2013 2:56 am UTC, edited 1 time in total. Rosetta as GLaDOS is perfect. I count 21 people, including Cuegan. Edit: ninja'd. How did you get the image so fast? It wasn't loading for me, I had to go to mscha's site to get it. ETA2: apparently I forgot that I did count Cuegan the first time. Last edited by taixzo on Wed Jul 24, 2013 3:05 am UTC, edited 2 times in total. I count 21 heads there, including Megan and Cueball. That means there's ~20 in the hills, as we thought. ETA: huh, I missed taixzo mentioning it. Well, redundancy is good, as they say, redundancy is good. Last edited by ChronosDragon on Wed Jul 24, 2013 3:09 am UTC, edited 2 times in total. How come I missed that "Still Alive" OTTification?! Brilliant, I love it! Did anyone do it for Portal 2? Last edited by BytEfLUSh on Wed Jul 24, 2013 3:09 am UTC, edited 3 times in total. This is the climax. As was previously said in different words: Groups of important pix have become more and more frequent, and longer since Lucky. There is evident danger. This is THE climax, not A climax. This is the end. Why? Correct me if I'm wrong, there isn't anything that doesn't really make sense that we have seen that we don't understand well enough (or are VERY likely to know). We know almost the exact year that this happened. We know where it happened. We know what is happening in the nature. The only things we aren't sure of are the things that have been brought up in the past few newpix, and what will happen. Almost all loose ends have been tied in.... there can't be much left, except maybe for a month or so worth of newpix left of survival with/against the other members of the group. This is the end, apart from maybe an epilogue (or five, if the GLR is inspired by Peter Jackson's take on LOTR). This link sort of addresses a lot of the unanswered questions from LOST (though some of it is just theorizing). Yurts! In the Mediterranean! What will they think of next! taixzo wrote: Edit: ninja'd. How did you get the image so fast? It wasn't loading for me, I had to go to mscha's site to get it. I just kept hitting "refresh". I was frankly surprised to be first; I'd forgotten to set up the reply page with the image tag ready, so I had to start from scratch. I'd counted 18, but I think you're right; there's a kid mostly-obscured by another kid there by the front. So there are 21 19 of them total. Last edited by CasCat on Wed Jul 24, 2013 10:09 pm UTC, edited 1 time in total. No LaPetite. Buzzcuts are popular, apparently. Also, about six or seven are kids. Pfhorrest wrote: ETA: Hey, I'm a pope apparently? And I get to make some kind of decree? Awesome, I've always wanted to do this: I hereby dissolve the religion (whichever it is I'm pope of, I guess) and mandate the adoption of critical rationalism among the former congregation. ...so, either the 40 are from the East, or learned their survival tricks from the east. Maybe. Then again, it's been 13,000 years, stuff has had time to percolate around. Last edited by ChronosDragon on Wed Jul 24, 2013 3:14 am UTC, edited 1 time in total. I only count 20 heads here: 7 kids and 13 adults. That also meshes with the numbers we had before (Cuegan, the Six, and Twelve back at camp). Where are people seeing a 21st head? so they walked to the river to learn what it means. we'll go a walking with Cueball and Meg. past all the wow trees and the pretty wowterfall. and built a castle in the little front yard. "You'll never take us alive!" Megan screamed. and with one last swipe the molpycat did flee. watching and waiting for break of day. and the bright sun drives away all night fears. we'll go a limping with Cueball and Meg. they found a tall tower from which to see. it was the Beanies, with spoken squigglies. they were fed and watered, and tried to speak. they went to the castle on a high mountain peak. With broken speech, she taught all about their sea. and their dear forty they nevermore will see. we'll go a learning with Cueball and Meg. and down the mountain Cuegan did fly. racing flood waters, their families they spied. we'll go a running with Cueball and Meg. 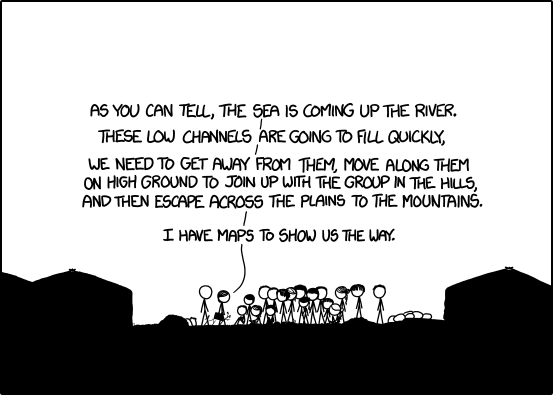 and bring them to high ground away from the sea? 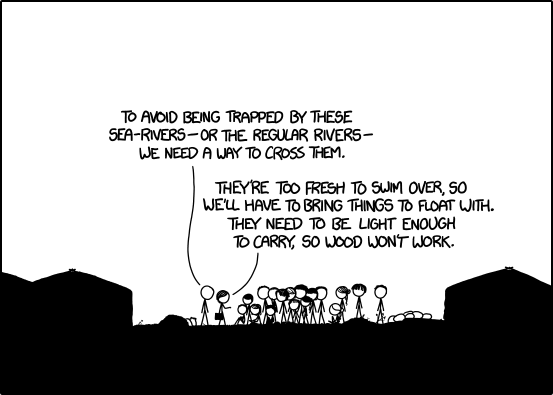 Or will they perish along with all their salt flats? They must run and we must wait and see. Pfhorrest wrote: I only count 20 heads here: 7 kids and 13 adults. That also meshes with the numbers we had before (Cuegan, the Six, and Twelve back at camp). Where are people seeing a 21st head? There are four kids seated near the front, one of them is most likely to be the one you're not seeing. Why have we not heard any of their names yet? Like they meet and start talking but no one says anyone's names??? They are all 'you're' 'him' 'her' or 'my sister'. With 40 people you are going to be on pretty good first name basis with everyone else right? ETA: What is that on number 13's head? is that a beret? Latent22 wrote: Why have we not heard any of their names yet? Like they meet and start talking but no one says anyone's names??? They are all 'you're' 'him' 'her' or 'my sister'. With 40 people you are going to be on pretty good first name basis with everyone else right? Not sure about the beret. I think Cueganite #11 is the glasses guy. Naturally, they all used each others' names extensively, but that happened during the blackout, when we couldn't see them! Latent22 wrote: ETA: What is that on number 13's head? is that a beret? I think it's a smaller version of the hairdo shared by Bunny and the other lady (note the trailing end). oh. Maybe, hair with pony tail. Whoa - a condiment! Many things to revisit (if there's time!). jazz14456 wrote: Is it just me, or does it feel like we are getting close to the climax? A climax, but not the climax. If they don't die here, they have many more adventures ahead. It's a long way to the mountain, and slower with 40 people. This is not the end of Time. It's not even close. Time won't end before the Mediterranian fills. CasCat wrote: And... on pix 8 they're running. So I'd call that about midway between me at 5 and ucim at "more than ten". IIRC, I didn't say "more than ten"... I said something like "If it's more than ten, then there will be a change in tactic." Don't be discouraged... while the thread may be moving slowly enough to do an occasional ottification, it's still moving way too fast for much in the way of comments. Even Acts of the Clerics only garnered two acknowledgements! The Sea is filling! RUN! jjjdavidson wrote: Now that you've brought this song to mind, I don't remember ever seeing it here── Has nobody gotten around to ottifying the "Time Warp?" Lets wait for Time once again! The hot sun is beaming! But they ought to be RUNNING! But we said "screw that noise, let's save our friends!" Last edited by Pfhorrest on Wed Jul 24, 2013 4:50 am UTC, edited 3 times in total. Major blindpost. I can't seem to ketchup at all todip, no matter at work or home. for all the Megball shippers. OMR that is so adorables! BlitzGirl wrote: Go LaPetite and the other kids! And Buzzcut and Bunny seem like very reasonable people. Buzzcut, Bunny and Bangs. I can't stop laughing. "I guess I just soaked up a bit too much Vat 69 here. And I'm down to my last dime and they wouldn't take my luggage as payment..."
Valarya wrote: Buzzcut, Bunny and Bangs. I can't stop laughing. Now it's more like Buzzcut, Buzzcut, Buzzcut, Buzzcut, Buzzcut, mini-Buzzcut, Bunny, and the three Bangs Brothers. And all the rest! Ah. In that case, you might want to check the redundant spoiler or open the image in a new tab. My monitor is 1920 by 1080, so I don't usually think about that. Last edited by taixzo on Wed Jul 24, 2013 4:02 am UTC, edited 2 times in total. A sea-river sounds like a dangerous hybrid: big, fast-moving, and does whatever it wants. BlitzGirl wrote: A sea-river sounds like a dangerous hybrid: big, fast-moving, and does whatever it wants. That sounds to me like a dragon! @Valarya - I did not detect your Tennessee accent. Your voice seems like it might be a good fit for Megan. 1. Indians of the Asian continent and the Indian Subcontinent, and the country of India. 2. Native Americans, indigenous peoples of North and South America, regardless of country or tribe. This is not a good confusion. But the use of each specific tribe is preferred anyways.